Choosing the pictures of a new location house to put on our Fresh Locations library is always a challenge, but perhaps never more so than in the case of ‘Park House’ in Richmond. Our new location – which we’re proud to say is exclusive to the Fresh Locations agency – is something very special. It’s a vast and grand house in the English country style but, incredibly, it’s located well within the capital, in leafy Richmond. ‘There are huge landscaped grounds, and a feeling of space – it offers a country house experience but twenty minutes from the West End, we’re the only ones doing that, it really is incomparable,’ enthuses Diana, who manages ‘Park House’ for its entrepreneur owners. Built in the 1700s it’s a house with an illustrious history and associations with many a famous name. But, in the 20th century, it was owned by an educational charity, its vast rooms compartmentalised up into unremarkable little boxes where an unloved and institutional atmosphere prevailed. When the property came onto the market a few years ago it was generally presumed that it would be divided up and developed into luxury apartments but it was lucky for this wonderful old house that it caught the eye of a British couple who saw the potential to create a unique home for their young family. ‘They really have incredible vision, to see that run-down building and be able to envisage the potential is one thing, but also to have the drive, determination and skill-set to actually make it happen. It took a lot of hard work and persistence,’ says Diana with admiration. The couple were full of respect and admiration for the house and see themselves very much as its custodians, but they did not want to verge on pastiche or to create a National Trust-like time capsule. Instead they have carefully – and successfully – created a balance between staying true to this house’s original essence and period character while also creating a comfortable and intimate family home with a modern edge, all the latest luxury features and the best of modern technology and security. The main rooms of this opulent house include eight [en suite?] 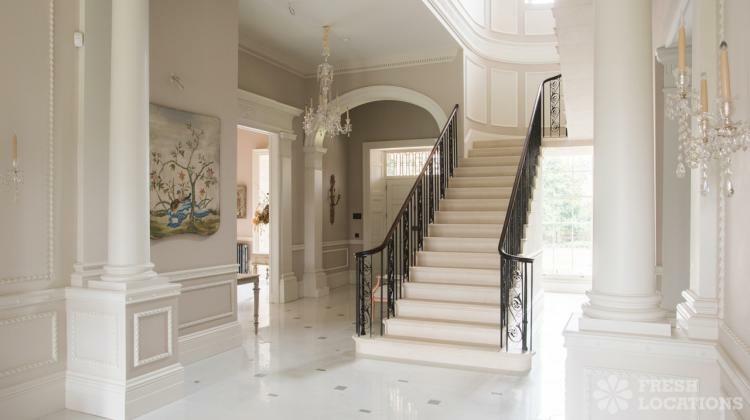 bedrooms, a family kitchen and a professional kitchen, two dining rooms and four reception rooms, one of them the vast and imposing entrance hall. Then add to this a private cinema and full professional spa featuring steam room, sauna and indoor pool. Outside in the huge grounds there are formal gardens, including a parterre and stunning reflecting pool, as well as tennis courts. For the colour palette, the couple worked with a specialist paint consultant. It was important to them to choose a beautiful but subtle colour scheme – one that would compete unduly with the many stunning period details in each room, ‘in a house like this, the rooms themselves need to do the talking,’ explains Diana. The colour palette works together as a whole to create a coherent, flowing space but within that, the individual rooms have been given their own distinct characters ‘they have taken into account the direction that each room faces to create subtle variations,’ explains Diana. For example, there’s a Wedgwood-inspired putty colour in the formal reception room and a beautiful shade of ash-rose in the main dining room.